During the Second World War, postal rates increased by ½d while stamp colours still had to meet the Universal Postal Union's requirements. To fill this role, the ½d stamp from the 1938 King George VI issue was surcharged 1d and the 1½d stamp surcharged 2d. This was a temporary measure to use up stocks and the stamps were printed in the correct colours without the surcharge later in 1941. 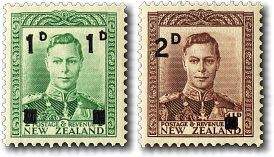 The 1938 King George VI stamps were surcharged again near the end of their life in the early 1950s and these stamps are listed separately under the 1952 King George VI Provisionals.